Pass a l'Outre Lighthouse, Louisiana LA 7. After Hurricane Katrina this lighthouse still exists, but not in it's entirety. 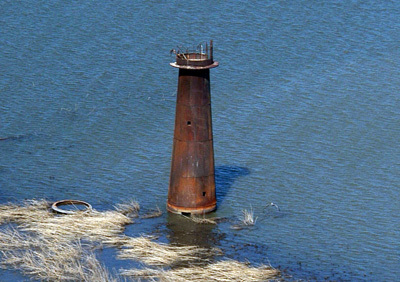 This lighthouse is in a very isolated place in the mouth of the Mississippi. There was once a keepers house here. I hate to think how hot, muggy and buggy it would be in these swamps in the summertime. 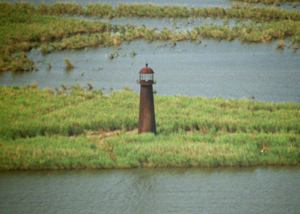 According to David Cipra's book "Lighthouses, Lightships and the Gulf of Mexico", when this lighthouse was discontinued in 1930, its light was less than three quarters of it's original height because of settling in the Mississippi River mud. We shot the "A" photo from a seaplane we chartered out of Houma, LA. in 1995. We also flew over it in June of 2005 and looked much the same. shows the condition of this lighthouse since Katrina. This is surely on the Doomsday List and probably will not be saved.